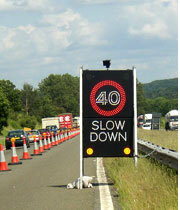 Our Speed Activated Variable Message Signs utilise a microwave vehicle detector (MVD) which constantly processes information on the speed of traffic travelling towards them. Activation speed can be modified to suit site conditions and the 750mm diameter display can read, 30, 40 or 50. Signs can be fitted with a Data Logging device to provide clients with traffic analysis which can be downloaded onto a PC device. 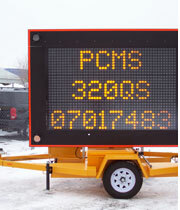 Signs are mounted on either A frames or trailers and can be powered by integrated battery packs or connected directly to mains. Variable Text Signing enables clients to keep travellers informed of incidents, congestion and road works through strategic placement of trailer mounted units. Character heights are in accordance with all current standards and legends can be changed from a remote location or controlled by ANPR (Automatic Number Plate Recognition). Signs are trailer mounted and can be powered by integrated generators or connected directly to mains.